Oddly, one of the best for us, in my mind at least, is sadly too often overlooked. 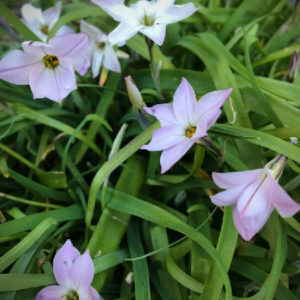 The Spring Starflower, Ipheion uniflorum, has a great number of assets that virtually demands we take a closer look. Native to the mountainous regions of Argentina and Uruguay, this bulbous plant is in the Amaryllis Family and closely enough related to Alliums (onions) that the flattened grass-like foliage possesses the same mild aroma if crushed. Taxonomists attempting to settle on its true name has not exactly been a pleasant walk in an Andean meadow on a sunny day. It has been placed in no less than nine genera with current attempts to change it yet again. However it was Ipheion that I came to admire it and, for the time being, Ipheion it remains. One of Spring Starflowers most utilitarian characteristics is that its mounds of bright green and broad foliage to 8″ in length emerges in autumn, providing presence during the off-season as well as weed suppression. When temperatures rise sufficiently in February (on normal years…) six-petaled, honey-scented flowers appear in an enormously long progression. By early summer- just as our skies in the PNW are no longer producing adequate water for growth—the bulbs slip into dormancy. This winter-season habit of growth lends itself perfectly to planting Ipheion at the base of deciduous trees and shrubs, adding entertainment to a space that is uninhabitable after leaves emerge. It is not particularly discerning in its choice of soil though will tend to gain in strength more quickly if planted in humus-rich environments. The Starflowers will, however, easily integrate into meadows and compete with grasses if not mown until mid-June. Happily, Ipheions are readily available through bulb catalogues and not particularly expensive. There are a few choices in color. ‘Alberto Castillo’ remains a favorite as its pure white flowers read so brilliantly during the dull days of late winter. Rich blues come by way of ‘Rolf Fiedler’ as well as ‘Wisley Blue; both good integrated with bright yellow Narcissus. The above pictured ‘Charlotte Bishop’ is the only pink flowering selection to be found. The sensationally warm days of this week have brought forth a panoply of bulbs, woodland perennials and early blossoming trees and shrubs throughout Heronswood. Visit us this Friday, Saturday and Sunday to admire for yourself how well this native of the Andes competes with the entire lot.